Yesterday the Icelandic central bank Sedlabanki hiked its key policy rate by 50bp to 5.50%. The hike was fully expected by the markets and is the second hike this year. I don’t have much time to write about this, but let me just briefly say that I think there are very good reasons for Sedlabanki to hike rates – in fact it looks as if Sedlabanki is even falling behind the curve and more rate hikes might be warranted. 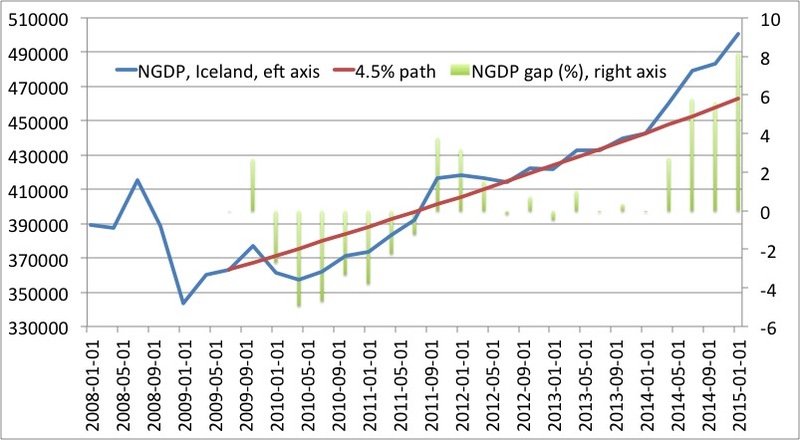 1) I have earlier argued that Sedlabanki since Mar Gudmundsson became governor in July 2009 has had a de facto 4.5% nominal GDP target (See here after 50:03). Hence, until recently NGDP was kept on a 4.5% path, but over the past year or so NGDP growth clearly has accelerated and Sedlabanki now forecasts NGDP growth of 10.6% in 2015, which clearly is far too strong and is not consistent with Sedbanki’s 2.5% inflation target. 2) It is always extremely useful in the conduct of monetary policy to keep an eye on market expectations and here the signal is very, very clear. 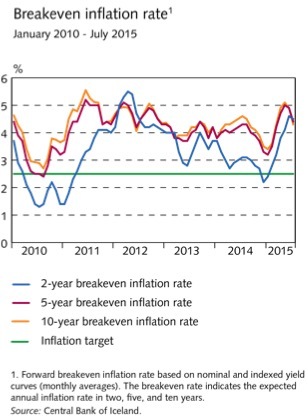 Recently inflation expectations have increased rather dramatically and both 2, 5 and 10 year breakeven inflation rates are now around 4.5% inflation – way above Sedlabanki’s 2.5% inflation target. 3) Money supply growth is picking up and (unadjusted) M3 growth is now approaching 15%, which sends a clear signal that inflation and nominal GDP growth could pick up even further. 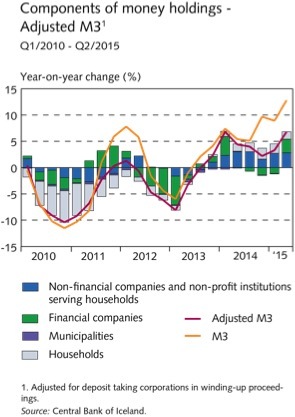 The adjusted M3 numbers, which probably is a more truthfully indicator of inflationary pressures have accelerated to above 5%, which also indicates increased inflationary pressures. So all in all I think it is very justified to hike interest rates for Sedlabanki and more is certainly needed to bring NGDP growth back towards 4-4-5% and reduce inflation expectations back towards Sedlabanki’s inflation target. One thing I have noted is that while I here focus on nominal variables and on expectations Sedlabanki is more focused on the labour market situation and the recent wage agreements. PS it is rather incredible that Iceland after a massive banking crisis in 2008-9 now is one of the very few countries in Europe with robust nominal spending growth and a need for monetary tightening. Well done – now make sure not to repeat the mistakes of earlier days. PPS big news out of Kazakhstan this morning – the central bank has floated the tenge. I strongly believe that this is the right decision on part of the Kazakh authorities. Pegged exchanges is generally not a good idea for commodity exporters (unless they peg to the export price). Scott Sumner a couple of days ago wrote a post on the what he believes is a Great Stagnation story for the US. I don’t agree with Scott about his pessimism about long-term US growth and I don’t think he does a particularly good job arguing his case. I hope to be able to write something on that in the coming days, but this Sunday I will instead focus on another matter Scott (indirectly) brought up in his Great Stagnation post – the question of causality between nominal and real shocks. The point Scott really is making here (other than the productivity story) is that it is real GDP that determines nominal GDP (“NGDP slowdown is real”). That doesn’t sound very (market) monetarist does it? Is this because because Scott – the founding father of market monetarism – suddenly has become a Keynesian that basically just thinks of nominal GDP as a “residual”? 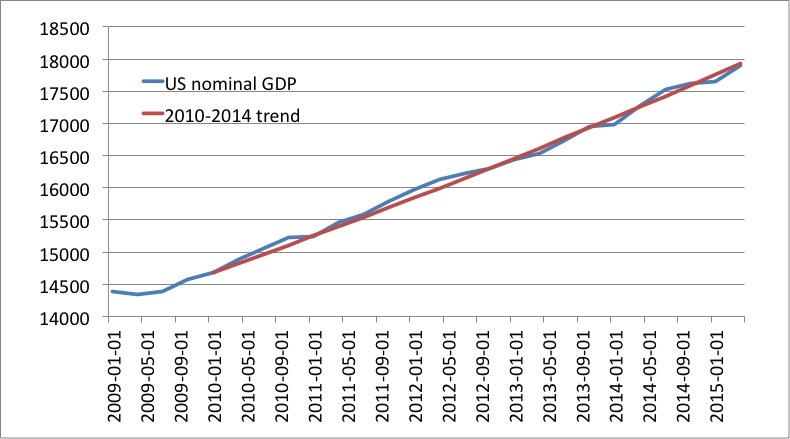 No, Scott has certainly not become a Keynesian, but rather Scott fully well knows that the causality between nominal and real shocks – whether RGDP determines NGDP or it is the other way around – is critically dependent on the monetary policy regime – a fact that most economists tend to forget or even fail to understand. Let me explain – I have earlier argued that we should think of the monetary policy rule as the “missing equation” in the our model of the world. The equation which “closes” the model. The equation of exchange says that the money supply/base (M) times the velocity of money (V) equals the price level (P) times real GDP (Y). The central bank controls M and sets M to hit a given nominal target. Market Monetarists of course have argued that central banks should set M so to hit an nominal GDP target. This essentially means that the central bank should set M so to hit a given target for P*Y. We know that in the long run real GDP is determined by supply side factors rather than by monetary factors. So if we have a NGDP target then the central bank basically pegs M*V, which means that if the growth rate in Y drops (the Great Stagnation story) then the growth rate of P (inflation) will increase. So we see that under an NGDP targeting regime the causality runs from M*V (and Y) to P. Inflation is so to speak the residual in the economy. But this is not what Scott indicates in the quote above. This is because he assumes that the Fed is targeting around 2% (in fact 1.8%) inflation. Therefore, IF the Fed in fact targets inflation – rather than NGDP – then in the equation of exchange the Fed “pegs” P (or rather the growth rate of P). Therefore, under inflation targeting the Fed will have to reduce the growth rate of M (for a given V) by exactly as much has the slowdown in (long-term) growth rate of Y to keep inflation (growth P) on track. This means that under inflation targeting shocks to Y (supply shocks) determines both M and P*Y, which of course also means that “NGDP slowdown is real” (as Scott argues) if we combine a slowdown in long-term Y growth and an inflation targeting regime. Scott since 2009 forcefully has argued that the Federal Reserve should target nominal GDP rather than inflation. I on the other hand believe that Scott has been even more succesfull than he believes and that the Federal Reserve already de facto has switched to an NGDP targeting regime (targeting 4% NGDP growth). Furthermore, I believe that the financial markets more or less realise this, which means that money demand (and therefore money-velocity) tend to move to reflect this regime. This also means that if Scott won the argument over NGDP targeting (in the US) then he is wrong assuming that that real shocks will become nominal (that Y determines M*V). The problem of course is that we are not entirely sure what the Fed really is targeting – and neither is most officials. As a consequence we should not think that the monetary-real causality in anyway is stable. This by the way is exactly why we can both have long and variable leads and lags in monetary policy. Over the past six years the “hawks” among UK and US central bankers have been proven wrong. They have continued to argue that a spike in inflation was just around the corner because monetary policy was “high accommodative”. Obviously Market Monetarists have continued to argue that monetary policy has not been easy, but rather to tight in the US and the UK – at least until 2012-13. The continued very low inflation continues to be an embarrassment for the hawks and looking into 2015-16 there are no indication that inflation is about to pick-up either in the US or in the UK. The sharp drop in oil prices in recent months is likely to further push down headline inflation in the coming months. Central bankers should obviously completely ignore any drop in inflation caused by a positive supply shock, but with most hawks completely obsessed with inflation targeting a hawkish stance will become harder and harder to justify from an inflation targeting perspective exactly at the time when it actually might become more justified than at any time before in the past six years. I would personally not be surprised if we get close to deflation in both the UK and the US in 2015 and maybe also in 2016 if we don’t get a rebound in oil prices, but I would also think that there is a pretty good chance that we could get 4-5% or maybe even higher nominal GDP growth in both the UK and US in 2015-16. And that would be a strong argument for a tighter monetary stance. Hence, if strict inflation targeters would follow their own logic then they would be advocating monetary easing in 2015-16 in both Britain and the US, while those of us who are more focused on NGDP growth will likely see an increasing need for monetary tightening in 2015-16. As a consequence if you are an old hawk who “feels” that there is a need for monetary tightening then you better stop looking at present inflation and instead start to focusing on expected NGDP growth. But of course the idea that you are hawkish or dovish is in itself an idiotic idea. You should never be hawkish or dovish as that in itself means that you are likely advocating some sort of discretionary monetary policy. What should concern you should be the rules of the game – the monetary policy regime.